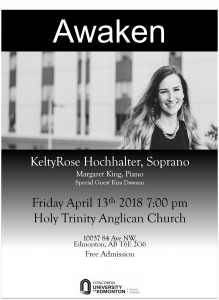 KeltyRose (Weiss) Hochhalter concludes three years of music studies at Concordia with her senior recital. The music of your favourite films, classic and contemporary, performed by handbells and handchimes! 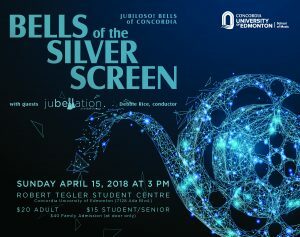 Concordia’s two handbell ensembles put their unique stamp on a wide spectrum of pieces from the silver screen, including beloved films like The Sound of Music, Star Wars, The Mission, Fiddler on the Roof, Les Misérables, Lion King, and Shrek. Jubiloso! Bells of Concordia, a 16-member community-based auditioned ensemble, performs on the largest set of handbells and handchimes in Canada, more than six octaves in all, and released a CD in 2016. JuBELLation is Concordia’s newest handbell orchestra, with teenaged to adult ringers. Conductor Debbie Rice is recognized internationally for her work in this field. She has served as Executive Director for the International Handbell Committee and as National President of the American Guild of English Handbell Ringers, the largest handbell organization worldwide, and travels frequently as a clinician and festival conductor in the U.S. and for international events. FREE TICKET for Concordia faculty, staff, & students–show your ID & pick up at the Bookstore during the week. Tickets: $20 adults, $15 students & seniors, available from the Bookstore, Tix on the Square, or at the door. Special family admission: $40 (available at the door only).